For years, people have warned against standing in front of a microwave while you nuking your leftovers for lunch. 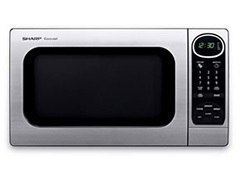 This concern stems from the fact that microwave ovens emit micro wavelength radiation.More specifically, the magnetron tube inside microwaves affects electrons by using magnetic and electric fields to produce that radiationat about 2450 Mega Hertz. But, the real concerns should be what these devices are doing to the food you ingest and to the environment in which we live. In other words, even the newest microwave models are killing our food—morphing the amino acids into toxic proteins. And, if you’ve ever nuked some plastic bowl or wrap up there along with your meal, you’ve unlocked the poisonous power of Bisphenol-A, which can cause neurological problems and hormonal imbalance as well. In addition, and arguably more importantly, the processes of this commonplace appliance are responsible for “38 million metric tons of carbon emissions,” according to Heather Zichal, deputy assistant to the president for energy and climate change. Now, in a half-cocked attempt to reduce the footprint and make microwaves more efficient, the Department of Energy is issuing new regulations and standards for America’s favorite quick and easy cooking method. The Energy Department’s new microwave standards are scheduled to take effect in 2016 with the aim of saving consumers money—$3 billion in lower energy bills by 2030. But, as Johnson suggests, the best way for Americans to truly improve the environment, save money and stop eating mutated food is to simply get rid of the microwave altogether. Is there really any benefit to a microwave besides convenience anyway? Does it make anything actually taste better? We have to make the time to use other cooking methods in our everyday life. By nixing the microwave, each and every one of our households can prevent a minimum of 5 milli-watts of radiation per square centimeter. Posted on November 26th under Pollution Reduction.